Most Windows computers have a built-in MS Paint program. It is a program that lets you edit and crop photos. Now, what if you’ve stumbled upon a computer without a built-in MS Paint? 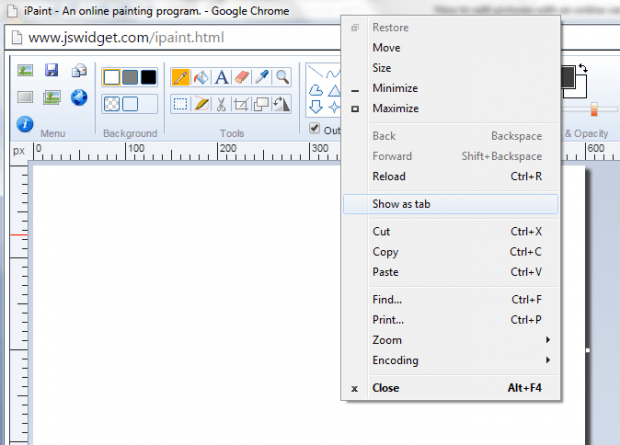 What if you’re browsing in Chrome or Firefox and you simply don’t want to load any extra program on your desktop? If that’s the case, then you might want to consider editing your pictures using an online version of MS Paint. Open your web browser. I recommend that you use a browser that supports HTML5 like Chrome or Firefox. Next, open “iPaint” using this link . It’s a free painting program that’s essentially an online version of MS Paint. Once you’re on the iPaint homepage, click “Try iPaint Now”. A new window will appear and it will load the iPaint editor. If you want to load iPaint in a new tab instead of a new window, just right-click on the editor’s title bar and then select “Show as tab”. You may then incorporate it with your other tabs. So that’s basically it. The iPaint editor greatly resembles the MS Paint interface so if you’re already familiar with using the latter, then it will very convenient for you to edit and crop your photos online. With iPaint, you can load an image from a local drive or from a direct URL online. It also supports online image search, unlimited undo/redo, adjust color opacity, etc.